Pins rising out of the corner poles of a section of frame scaffolding fit into recesses in the bottom of the corner poles of the section being stacked onto the lower section. Pin clips are placed through the connection to prevent the sections from coming apart. Boards or aluminum deck planks are placed across the completed frame scaffolding sections to give workers a place to stand while assembling the next section of scaffolding. The bottom-most section of frame scaffolding is commonly set upon threaded stands that include large-winged adjustment nuts. The scaffolding is adjusted and leveled by turning these adjusting nuts until the desired lean or level is achieved. The sections of frame scaffolding not only provide workers with a place to work from, but the sections also act as a ladder to allow workers a way to reach the desired working height. Ropes hung from the uppermost section of scaffolding provide a way for workers to hoist materials up to their working level. Occasionally, when working with heavy materials such as concrete blocks, a power hoist will be employed to aid in the raising of the materials. It is not uncommon to see workers performing duties from multiple levels of a scaffolding tower at the same time. 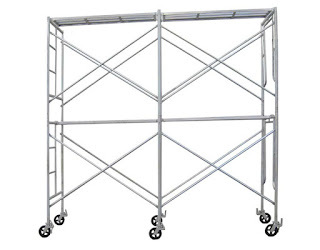 The frame scaffolding is commonly brought to the work site by truck. It is common for a construction supply or rental agency to provide the scaffolding for any given job. This is partially due to the tremendous amount of scaffolding sections, cross poles and locking pins required on any given job that would be too expensive for a single company to purchase for the occasional job that requires the use of scaffolding. 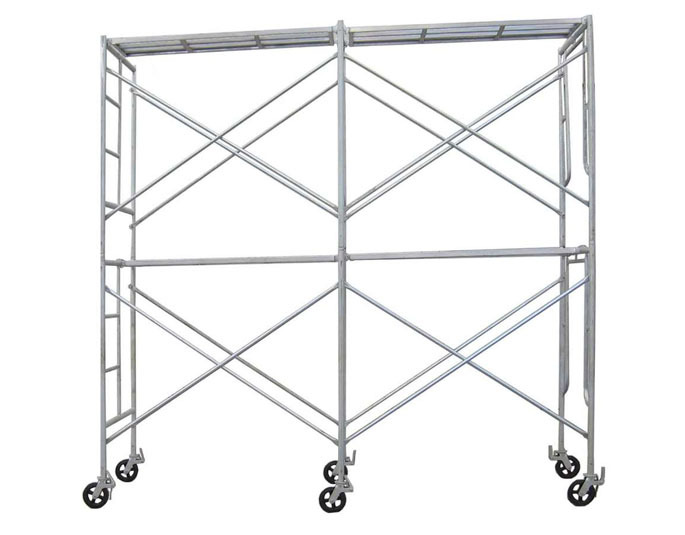 The rental agency will deliver the frame scaffolding supplies to the job site, however, it is usually the job of the construction crew to assemble and tear down the scaffolding.